Welcome back to the world of Dirk Gently’s Holistic Detective Agency. Every season is a dizzying, smart, dangerous, unexpected (for us, not the people involved) and fun adventure that explores a different genre. Season one was about time travel with body-swapping, and this season involves an injection of fantasy. The vast dangers lurking in the magical realm of Wendimoor navigate a path to Earth, becoming a threat and it’s up to Dirk Gently (Samuel Barnett) and the gang to stop them in their tracks. But first things first – they need to find each other…Dirk Gently’s Holistic Detective Agency, written by Max Landis (American Ultra, Chronicle) and adapted from the wildly popular novels by Douglas Adams (“The Hitchhiker’s Guide to the Galaxy”), returns for its second season in early January on Netflix.The season begins with Dirk trapped in the government organization of Blackwing for the last two months, unfortunately re-immersed in the nightmares of his childhood, and separated from Todd (Elijah Wood) and Farah (Jade Eshete). Dirk seems to be utterly defeated in his current surroundings with no obvious way out. Meanwhile, Todd and Farah are free, but on the run from the authorities. They are desperately clinging to what remains of their resolve to be reunited with not only Dirk, but also Todd’s sister, Amanda (Hannah Marks).Like Dirk, with the exception of Vogel (Osric Chau), the Rowdy 3 (Michael Eklund, Viv Leacock, and Zak Santiago) have been captured by Blackwing; Vogel escaped with Amanda and they are determined to help their friends escape from Blackwing, if only they can find its top-secret location. Mr. Priest (Alan Tudyk), Blackwing’s enforcer, is in hot pursuit of them, and their time is quickly running out.Blackwing is back up and running, but under the confused direction of its new leader, Hugo Friedkin (Dustin Milligan). He is unable to make heads or tails of the existing Blackwing subjects and their “gifts”, and finding that their vague powers offer him only frustration. Over time, he receives reassurance and guidance from his interactions with Ken (Mpho Koaho), the newest addition to the Blackwing subjects.Meanwhile, Bart (Fiona Dourif) is traveling solo, looking for Ken every chance she gets. She is now in a self-imposed rehabilitation from her innate violent ways, but it’s not yet clear what impact her defiance will have on the universe.Elsewhere, a woman named Suzie Boreton (Amanda Walsh) has a very bad day.Everything and everyone continues to be connected… from the sterile chambers of Blackwing, to the sleepy town of Bergsberg and the magical land of Wendimoor. 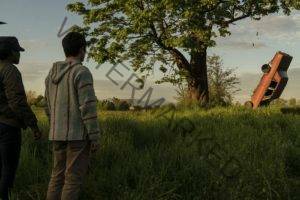 After a few misfires, Dirk Gently steadily finds his footing on the new case to “find The Boy”, and with the help of his friends, makes the necessary connections to solve the mystery before it’s too late. Dirk Gently’s Holistic Detective Agency is a co-production of AMC Studios, IDEATE MEDIA and IDW Entertainment, with Circle of Confusion producing for BBC AMERICA. Max Landis created and executive produces the series with Robert Cooper serving as executive producer and showrunner. Arvind Ethan David and Zainir Aminullah are executive producing for IDEATE MEDIA, Ted Adams and David Ozer for IDW and David Alpert and Rick Jacobs for Circle of Confusion. The ten-part series will stream globally on Netflix in countries outside the U.S.